I have a “go-to” lentil soup recipe that I’ve been making for several years. It’s a typical lentil soup with carrots, thyme, etc., and it’s very good. 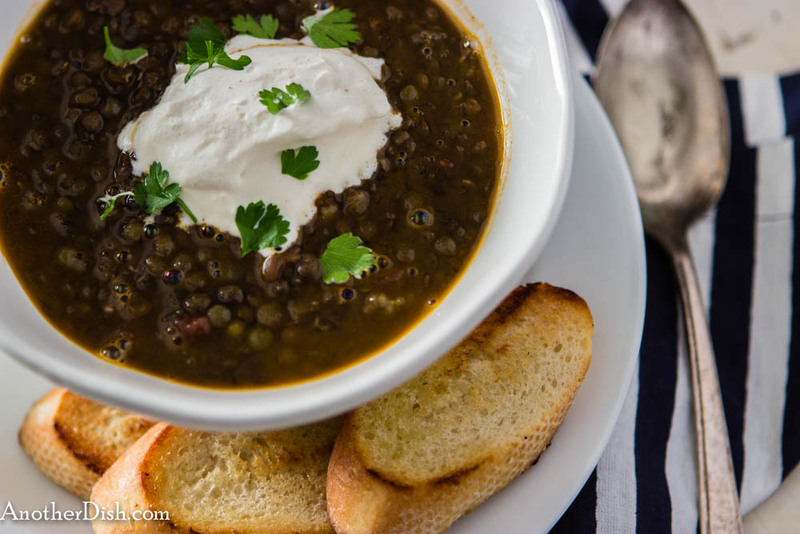 I wanted to try a different version; I found this Italian lentil soup recipe, and it’s delicious! I think the toasted saffron steeped in warmed Cognac are what make this dish. I hope you’ll try it! Lightly toast the saffron in a small, heavy skillet over high heat, then stir into 2 Tbsp of the warmed Cognac in a small bowl. Set aside to steep. Heat oil in a Dutch oven over medium-high heat. Add the pancetta and saute for 5 minutes, stirring in the garlic the last 30 seconds. Add bay leaf, water, lentils, saffron/cognac mixture, tomatoes and salt. Bring to a boil, stirring well. Reduce heat to low and simmer for 1/2 hour. Remove from heat and stir in the red wine vinegar. Season with additional salt, if desired (I added another tsp salt, and thought that was good). Let soup sit for a bit, uncovered. Meanwhile, whisk together in a small metal bowl the cream, remaining 1 Tbsp Cognac and ground cloves until thick. Cover and place in refrigerator. Heat about 1 Tbsp olive oil in a heavy skillet over medium-high heat. Add baguette slices and lightly brown on both sides. Ladle soup into bowls. Place a dollop of cream mixture over each and garnish with parsley. Serve with toasted baguette slices. This entry was posted in Beans, Italian, Main Dishes and tagged Cooking, Food, Food Photography, Foodie, Italian Food, Recipes on November 12, 2013 by AnotherDish. Thank you. I looked at your recipe and it looks like another fantastic variation of lentil soup, especially with the spice combo and the very unique Moroccan addition of equal parts parsley and cilantro! Can’t wait to try it!